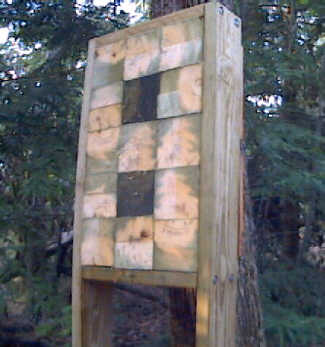 At first I built various side grain targets out of 4"x4" and 4"x6" lumber which wore out pretty quickly. Now I have come up with an "end-grain" target that works really well, especially if I spray it with a hose each time before I use it, as suggested in The Great Throwzini's 101 knife throwing tips. I use 6"x6" posts cut to 5 1/2" lengths which are held, pressure fit only, within a frame of 2"x6" pressure treated lumber. The side pieces, (legs), are 5'6" long. I arrange the 6"x6" "end-grain" blocks between the legs, leaving space for a 2"x6" cross piece at the top, and press them together with strong pipe clamps on the outside of the legs. I cut top and bottom cross pieces out of the 2"x6" lumber just slightly shorter than the space between the side pieces and place them between the legs. Next, I cinch the whole assembly up tight with side to side and top to bottom clamps, then I drill guide holes and draw everything up tight with 2 - 3/8"x4" hex head screws and washers through the legs and into each end of the cross pieces. I also counter-sink the screw heads so they do not stick out where the knife could hit them. Finally, I screw a backing made of plywood or scrap 1" x whatever lumber on the back of the target so the individual end-grain blocks don't get forced out the back by heavy knife hits. I use the targets by leaning them against a tree, but I could also attach 6'6" angle pieces at the top of each side to make them free-standing. One target I made is a single target made up of 15 end-grain blocks arranged three across and five down. 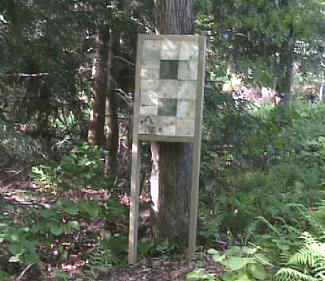 The other is a double target with 18 blocks in two three by three sets separated by a middle cross piece of 2"x6" lumber. The middle cross piece puts the target centers a little further apart and makes it safer to throw two knives at a time without having them hit each other. The extra cross piece also helps to keep all the blocks tightly in place, since the top to bottom span is 6" longer on the double target. Perhaps other people have figured out this same design. It provides a really nice end grain-target for a total cost of about $30 each. After I saw a video of the movie "Still Breathing" I bought a set of Mini-Blazing Arrows and made an indoor target out of plain 2"x4" lumber, with 15 - 6"x6" end-grain blocks cut only 3 1/4" thick. It costs even less and also works great!